Bearing your choice of map, these sturdy shower curtains capture the details of your favorite place. It was always in the shower where she realized her place on the map. 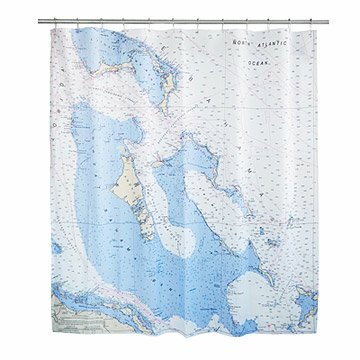 Bearing your choice of map or nautical chart, these sturdy shower curtains capture the details of a land lover's favorite getaway or a seafarer's most storied stretch of the big blue. They map cherished terrain with cartographic details depicting a 150 mile radius around your favorite U.S. location on land or sea. Great for beach houses, guest bathrooms, or any map lover in your life. Made by Heather Jernegan in Denver, Colorado. You could say that printing is in Heather Jernegan's blood. Born into one of Massachusetts' largest screen-printing and promotional products companies, she has been helping to create custom apparel, accessories, and incentives for over 15 years. Heather grew up on the North Shore of New England where boating is a popular pastime and "yachting is practically a religion." To this day, spend as much time as possible near the water and it's also where she find her design inspiration. Her charming line of nautical accessories has been recognized by yacht clubs, charter companies, nautical corporations, and coastal resorts, and boutiques nationwide. Please note, map will be of your area- specified by your address including up to 150 surrounding miles.